The dress looks fabulous, and I love the way the slit at the back hem echoes the opening in the back bodice. I had not even thought about the added “slit” in that regard! Great to hear from you! 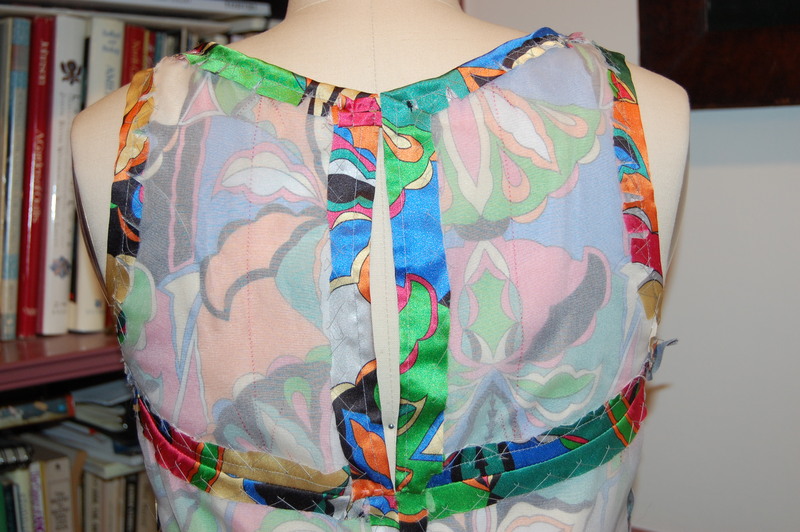 “I wonder if other sewers/dressmakers do that?” – The answer is YES! A project involving some engineering will often keep me awake at night! Beautiful details on your dress! I especially love how you matched the print at the center front curve of the yoke. Well, I’m glad to know I am not the only one thinking sewing at all times! I’m glad you like the dress! Karen, that dress is simply phenomenal. Your attention to detail is truly inspiring. I could finally see the front yoke, but your matching was so perfect that it was hard! Love all of your changes and your turquoise understitching. Just gorgeous. Can’t wait to see the jacket. BTW, I know what you mean about thinking about a project whether actually sewing or not. I’ve dreamed about projects before and come up with solutions in the middle of the night! Your dress is absolutely magnificent. Your choice of fabric couldn’t be more perfect. You will have a stunning outfit when the jacket is complete. I can’t wait to see the jacket. I am so in love with this pattern. I have put in a bid for one on Ebay. Thank you for all the inspiration your blogs gives to fellow sewers like me. It seems like a lot of us think sewing all the time! Thanks so much for your lovely comment! Fabulous work and wonderful results. 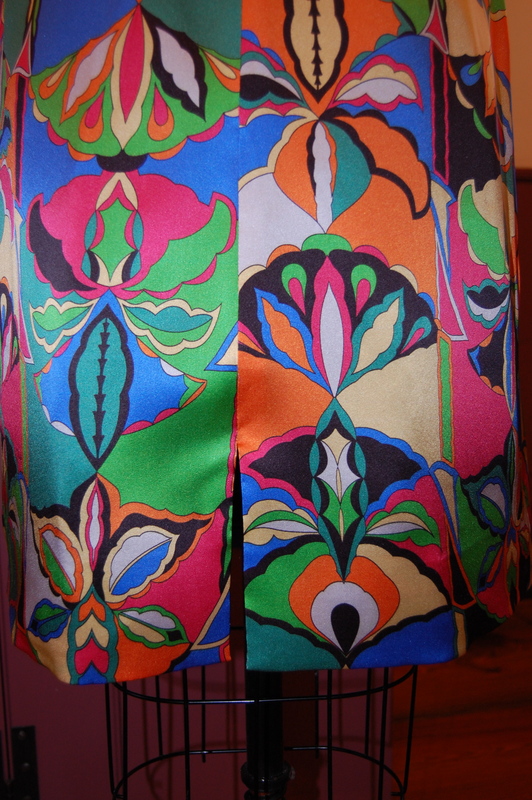 The fabric is stunning – so vibrant. 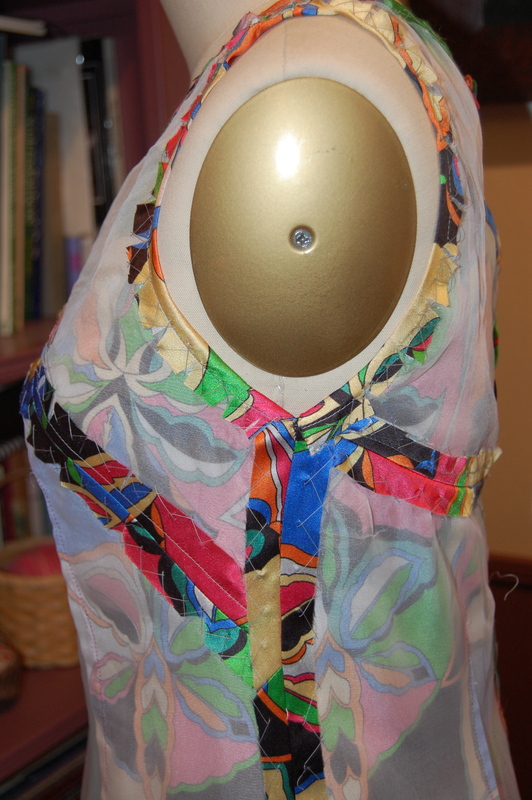 I love that you have underlined and lined the dress – it will feel luxurious to wear and hangs beautifully. My non sewing hours are frequently interrupted by random and not so random sewing thoughts – even, I have to confess, my work hours. I love it that all sewers seem to have this little obsession. Makes life much more fun. I agree – life is much more fun with minds full of fabrics, patterns, fashion, and sewing. So glad you like the fabric – I love it more and more all the time! Thanks so much for your interesting and delightful comment! Love the back. Please show a pic of you wearing. It has never occurred to me to use a different color for understitching — or to do it by hand. But wow — that looks so great! I can’t wait to give it a try! 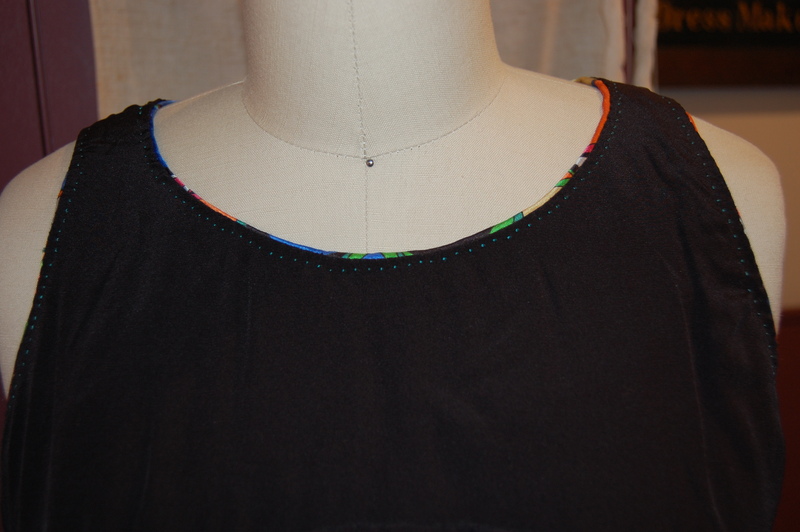 I usually do my under-stitching in matching thread – but I love the effect that I got with this contrasting thread. Thanks so much for commenting! You really are a master at matching. Thanks for walking through your alterations. It’s good to see the process. Thanks, Lizzie! I love the process of sewing, as you can tell! Great to hear from you, as usual! Great job! I love your rendition. 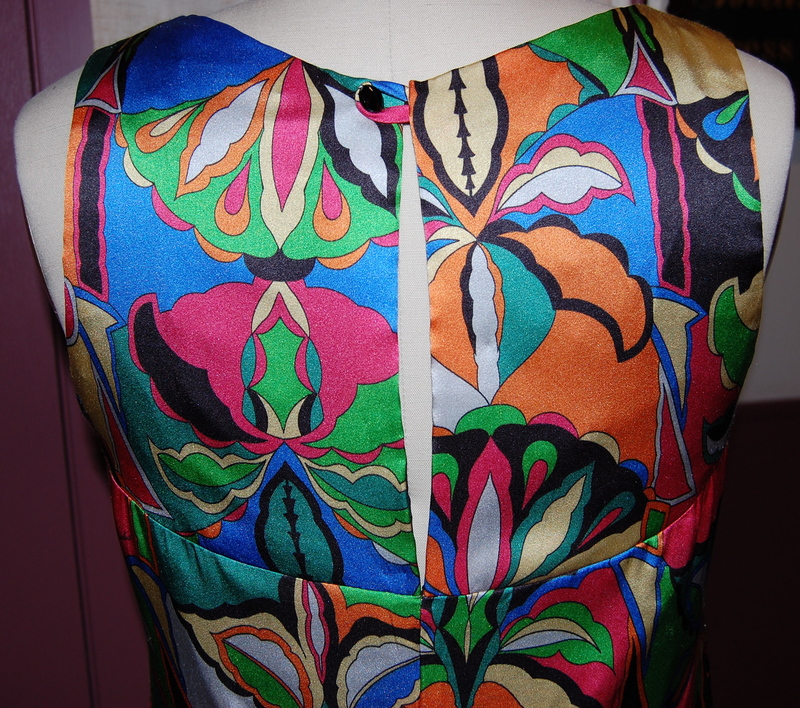 I believe you’ve inspired me to go on the hunt for another Pucci pattern. Love it! Glad I happened across your blog. Thank you so much! I so, so appreciate your mention of my blog on your website! Oh it’s a beauty! Your pattern matching on that yoke is so good it took me a while to actually be able to find the yoke. 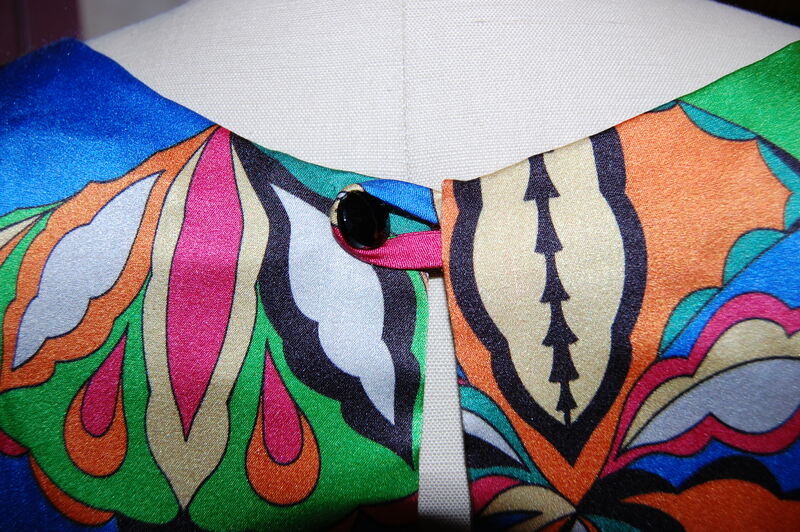 And that subtle peep slit at the back yoke – divine. And nope, you’re not the only one – my spare moments during waking hours are always spent daydreaming about the fabric, the pattern and how I’m going to bring them both together. 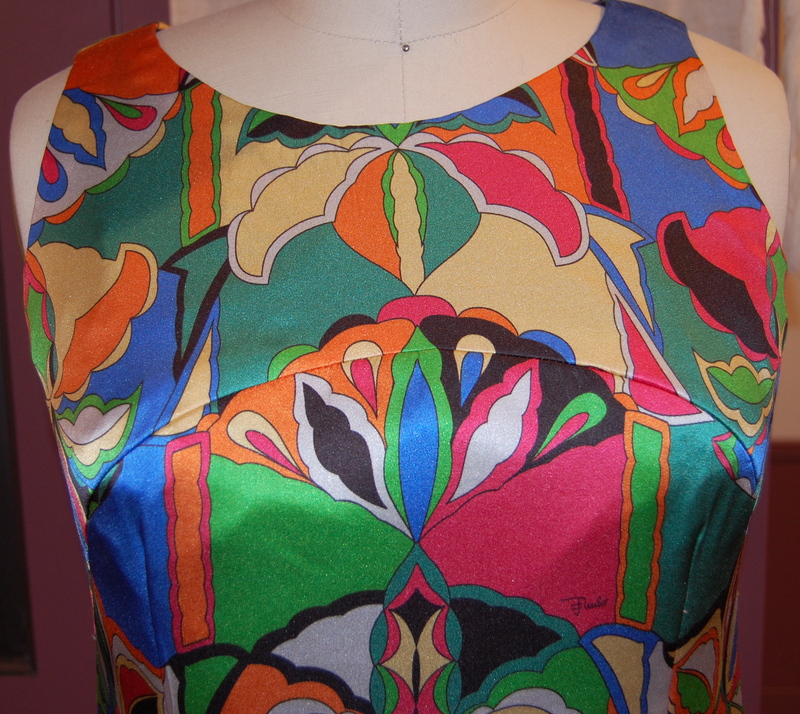 I think you may have just inspired a collective online hunt for vintage Pucci patterns… they really are lovely! I, for one, am always on the hunt for more Pucci! I think we are in good company with our daydreams about sewing – and it’s comforting to know I am not the only one who indulges in these constant musings! Gosh this is a lovely dress and I love the idea of the hidden understitching that only you know is there in vibrant turquoise. Lovely – like the hand stitching on your blocked coat but more secret. Thanks for following the trail on this dress and jacket!